Why is it important that the pest be identified before treatment? How do I identify the species of pest I’m dealing with? What kind of products will you use in my home? How long will I need to be away from my home or business during treatment? On what criteria do you base your warranties on? Why do pests carry such awful diseases? What do I need to do to prepare my home for treatment? 1. Why is it important that the pest be identified before treatment? Each insect, rodent and bird has its own pattern of behaviour. It’s important that we know what we’re dealing with so we can use the right product with the right approach to eradicate and prevent them from coming back. 2. How do I identify the species of pest I’m dealing with? There are clear-cut signs some pests leave to announce their presence. 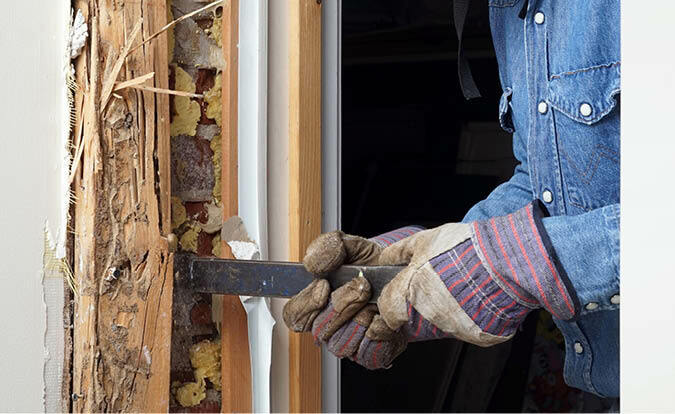 Buckling walls and floors may indicate termites. Cockroaches leave tiny, black droppings in their wake and fleas leave small red bumps that cause itching and irritation. Visit the pest pages on this site for more information about how to identify the type of pest you may be dealing with. If you are still unsure, give us a call and we’ll be happy to help you. Collect a sample and place it in a sealed container prior to our visit. 3. What kind of products will you use in my home? The type of product we use will depend upon the type of pest infesting the space. We are fully accredited for Termatrac and Termidor products, but rodent and bird removal can be as simple as setting traps or using a net to remove them from your property. 4. Is there a smell? No. Most of our clients are surprised to discover that there is no odour associated with our chemicals. 5. How long will I need to be away from my home or business during treatment? For your protection, we recommend you stay away from spaces being treated for one hour. 6. On what criteria do you base your warranties on? Our warranties are based on manufacturer recommendations. If you have questions about a specific treatment, please contact our office. We’re happy to share that information. 7. Why do pests carry such awful diseases? Pests live in the wild, making them susceptible to a wide variety of diseases, which they carry into your house or place of business and leave on your surfaces. In addition, they leave faeces or track in the faeces of other animals, which can be ingested by your family members, customers or employees. And mosquitoes and fleas can transmit diseased blood particles from other hosts into your bloodstream when they bite. 8. What do I need to do to prepare my home for treatment? Make plans to be away from your home or business for an hour during treatment. Before leaving, cover birds and fish tanks and move pet bowls and water dishes. And clear floors of small objects to ensure even chemical coverage.